A recent APM Reports documentary showed how schools aren't adequately complying with a decades-old federal law but new state laws are failing to help struggling readers, too. For more than 40 years, federal law has required schools to identify and evaluate students with dyslexia and to provide them with an appropriate education. But in many states across the country that's not happening, according to an examination by APM Reports. While 33 states have passed dyslexia-related legislation in the past five years, accountability is still lacking, funding sparse and confusion widespread throughout U.S. schools about the reading disability. The analysis comes a month after APM Reports produced a radio documentary called Hard To Read that told the stories of families fighting school districts to make sure their dyslexic children are properly taught to read. Scores of people responded to the report, sharing stories of frustration with their schools. Scientists estimate that between 5 and 12 percent of American kids have dyslexia. The flurry of new state laws over the past five years is in large part the result of pressure from Decoding Dyslexia, a parent advocacy group with chapters in all 50 states. But the laws haven't been enough to ensure that all children are taught to read, leaving many families to fend for themselves when it comes to getting their kids the right kind of help. In Texas, for example, at least a dozen bills have passed but "there's nobody stepping up and enforcing these laws," said Robbi Cooper, who oversees state and federal policy for the Texas chapter of Decoding Dyslexia. "This is not a parents against educators dilemma. It is a choice by commissioners of education and school boards to allow superintendents and others to treat these laws as optional suggestions." New Jersey passed a law in 2014 that requires all public school students to be screened for dyslexia by the end of first grade, but not all schools are following the law, said Liz Barnes, a founding member of Decoding Dyslexia New Jersey. "Families often have to pursue legal options to make (screening) happen." Part of the problem, according to advocates, is that once states pass laws, it's up to education agencies to issue guidance to schools. That can take years, and sometimes schools still don't know what to do. "We have a really good screening law, but it's not being implemented with fidelity," said Allison Quirion, founder of Decoding Dyslexia Connecticut. "Many schools don't understand what's required of them." More than a dozen states — including Arizona, Minnesota, Nebraska and West Virginia — have passed laws to simply define dyslexia, reflecting the fact that there's much confusion about dyslexia in our nation's public schools. Connecticut passed a law to add the term dyslexia to special education forms, even though the federal special education law has included the term dyslexia since it was passed by Congress in 1975. A law in California was amended to clarify that if a student with dyslexia does not qualify for special education services, they should still receive appropriate reading intervention. The first state dyslexia laws in the U.S. came in 1985 when Texas legislated the definition of dyslexia, mandated screening, and required training for teachers. The training law was subsequently repealed, however, and even though there was already a screening requirement, advocates say it was ineffective. They pushed a new bill in 2017 that required all students to be screened for dyslexia at the end of kindergarten and first grade. "Intensive advocacy falls on parents who have nothing to lose but the promising future a good education ensures our children," said Cooper. One reason schools fail to provide dyslexic students with the proper services is that teachers aren't learning how to teach reading, according to a 2010 report by the U.S. Department of Education. Much of this goes back to a long-standing philosophical debate about reading instruction that was largely settled by a Congressionally-mandated review of research released back in 2000. But most teacher preparation programs have failed to fully respond to the findings of that report, according to the National Council on Teacher Quality, a think tank in Washington, D.C. Some states are trying to address this by requiring changes in teacher training. In April, the Oklahoma governor signed a bill that requires state education agencies to ensure that teacher preparation programs are providing "quality" training in how to teach students with dyslexia to read. A 2016 law in Virginia requires people seeking a teaching license to complete dyslexia awareness training. In Tennessee, state lawmakers amended the state code to "authorize and encourage" teacher preparation programs to offer coursework on brain science and dyslexia. 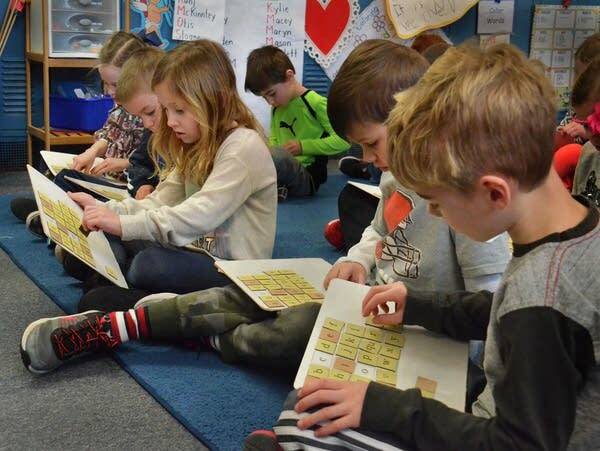 Connecticut, Mississippi and Wisconsin require new teachers to pass a "Foundations of Reading" test, an effort intended not just to help students with dyslexia but to make sure new teachers know how to help all kids learn to read. But a theme among all dyslexia-related state legislation is that it typically comes with no additional money. It's up to school districts to figure out how to pay for the training and other measures required by these laws. For example a 2014 Iowa law called for more teacher training but the bill came with no state funding. A spokeswoman for the state's department of education said until there is funding, the state is not required to provide dyslexia-specific training. Katie Greving, president of Decoding Dyslexia Iowa, said her group is dealing with its frustration by taking action. "Our volunteer group of 10 to 20 parents and educators has been providing almost all of the teacher training on dyslexia in our state," she said. Barnes, from New Jersey, reduces the states' rationale for inadequately dealing with dyslexia to a simple point. "This is basic education, to teach kids to read." The fall season of four education documentaries can be heard via the Educate podcast.